You are currently browsing the tag archive for the ‘kana script’ tag. 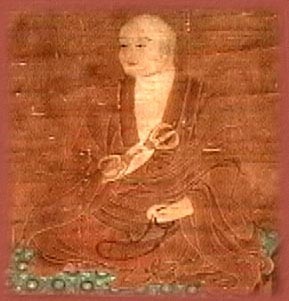 Kobo Daishi a.k.a. Kukai (774-835) is credited with the creation of the first public school in Japan? Or that he is said to have established in 828A.D. the first tuition-free university for commoners (Shugeishuchi-in) in Kyoto? Although the above entry states that Kukai’s invention of the kana script is an unattested fact, it is a plausible theory of origins, see a detailed paper entitled “Siddham in China and Japan” Sino-Platonic Papers, 88, 1998, in which there is clear evidence that Kukai studied Sanskript and Siddham under Prajna, a monk from Kashmir while on mission in China, that he had brought the first primer for learning Siddham by Chih-kuang to Japan in 806AD and that he was the first Japanese to write in the Siddham script in Japan (Annen née 841, was however the first Japanese to write a full treatise on the Siddham script called shittanzo in Japanese and in his treatise, he discusses how Kukai developed the tone inflections). Annen and other scholars in a competitive atmosphere, further developed Japanese pronunciations and writings of the Siddham script into transcribed Japanese by rationalizing both Old Chinese (predominantly Northern and Middle Chinese sounds) and North Indian sounds/pronunciations (it seems that Indian missionaries at work in China were apt to pronounce the Siddham sounds with their own native pronunciations, and that Chinese words incorporated into Japanese similarly borrowed sounds that had both northern and southern differences).